04 - 08 FORD / LINCOLN. 5.4L SOHC V8 (24-Valve), TRITON (3V) Engine ONLY. New Timing Chain Kit W/ Cover Seals (Updated Tensioners), Water Pump, & Oil Pump. 05 - 06 FORD EXPEDITION 5.4L 330CID V8 SOHC (24 VALVE) VIN Code "5". 06 - 08 FORD F-150 5.4L 330CID V8 FLEX SOHC (24 VALVE) VIN Code "V". 04 - 08 FORD F-150 5.4L 330CID V8 SOHC (24 VALVE) VIN Code "5". 05 - 08 FORD F-250 SUPER DUTY 5.4L 330CID V8 SOHC (24 VALVE) VIN Code "5". 05 - 08 FORD F-350 SUPER DUTY 5.4L 330CID V8 SOHC (24 VALVE) VIN Code "5". 06 - 06 LINCOLN MARK LT 5.4L 330CID V8 SOHC (24 VALVE) VIN Code "5". 05 - 06 LINCOLN NAVIGATOR 5.4L 330CID V8 SOHC (24 VALVE) VIN Code "5". 2 TIMING CHAINS (122 LINKS). 1 TENSIONER (LEFT UPPER) - "Updated Style". 1 TENSIONER (RIGHT UPPER) - "Updated Style". 1 CRANK GEAR (DOUBLE ROW-ONE SIDE RECESSED ONLY). 1 WATER PUMP SET (30mm). 1 OIL PUMP (24mm Inlet). 1 CRANKSHAFT FRONT OIL SEAL. Cam Phasers & Sprockets are NOT Included. Will NOT Fit 2004 F-150 Heritage (old style). 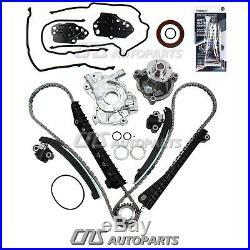 The item "Timing Chain Kit Oil&Water Pump Cover Gasket For 04-08 Ford F150 Lincoln 5.4L 3V" is in sale since Thursday, June 5, 2014.